Thanks to some great friends giving me a lift, I made it up to Mooloolaba on Friday night which meant come Saturday there was less of the mad pre race rush to get everything sorted and score a good spot in transition. As soon as I arrived in Mooloolaba you could feel the atmosphere. I was staying with a great bunch of friends- a mix of brilliant supporters and fellow racers- and I was so excited for this weekend to begin! After staying up chatting way past my bedtime it was finally time to get some sleep. I arranged to go for a warm up ride with another of our RTCC cyclists in the morning and so the alarm was set and I was ready for what was sure going to be a brilliant weekend. The alarm went off and it was a GORGEOUS morning in Mooloolaba. Looking out the balcony there were so many cyclists already out on their pre race rides and I was excited to get out there and join them enjoying the morning. Out we headed for what I had hoped was going to be an easy short ride (given my extreme lack of training! ), it was a gorgeous ride and I started out strong but it wasn’t long before my riding partner was breaking away ahead of me (conveniently started shortly after we were passed by another rider – not like males to be competitive right?). In my attempts to keep up, I managed to flare up a tightness in my hip which just made me fall further and further behind. Eventually we decided it was probably best to turn around…and that we did to finish up a great 20km ride before breakfast! After brekky it was time to head down to the Expo and secure myself a spot in the line for check in (to avoid the long wait in the sun like I had to do at Noosa in Novemember). Before I knew it I was through check in and headed back to the room to get my bike and find my perfect spot in transition! Lucky for me I was one of the first under 30s to rack their bikes and I had almost pick of the spot I wanted for my transition. 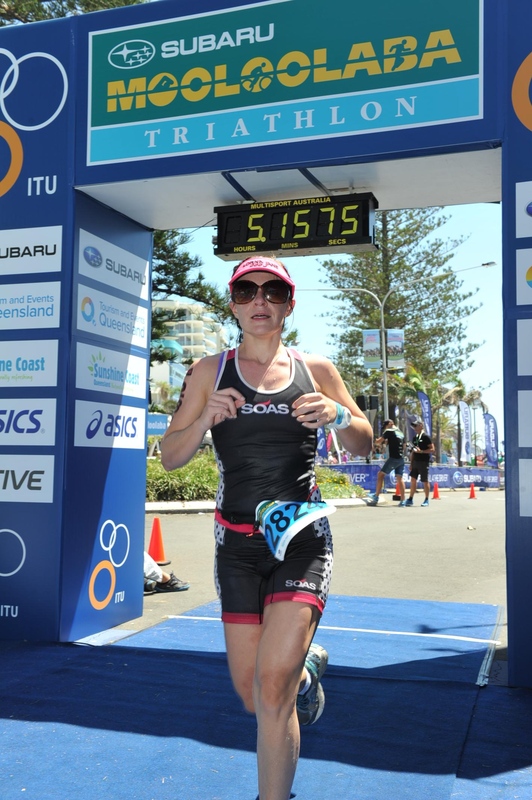 All I look for in a transition spot is something that is easy to find from the swim and after the ride- the spot I found was a dead straight line from both entries- PERFECT! Now that I was checked in and had my bike racked…all I had left to do for the day was carb load and relax! 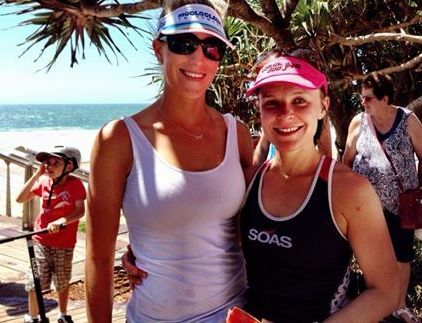 I watched the pro’s in the ITU races and caught up with some other friends who were also up for the tri the next day. 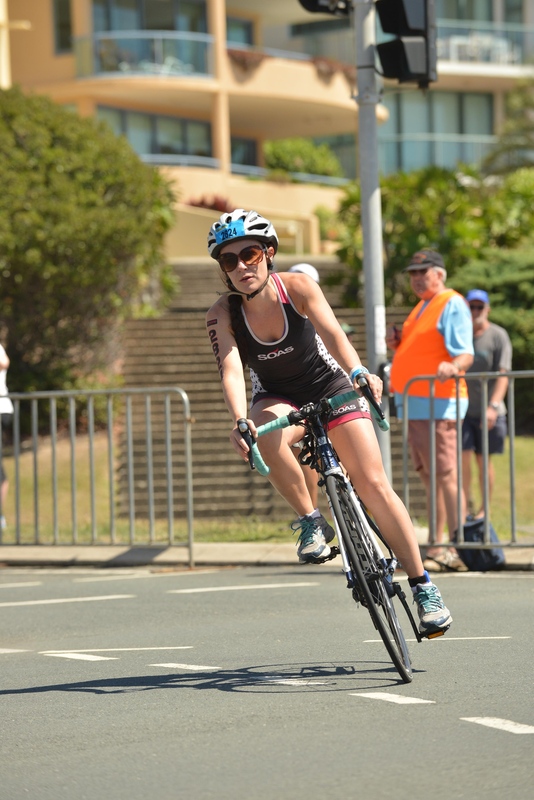 I was on an absolute high and the atmosphere in Mooloolaba was buzzing. After I prepared my bag for transition set up, it was early to bed for a 5am raise to set up transition and then wait until 8:26am for my race. I woke up at 11:30pm thinking it was almost time to get up and I felt like I had had a great sleep- I woke up multiple times after that with the excitement of what was t come the next day and eventually it was actually time to get up. Off to transition to set up and pump up my tires, before returning to the room (which was conveniently less thatn 500m away) for breakfast and a chill out before heading down to meet my sister before my race. Surprisingly the 3 hour wait before my race passed quickly and before I knew it itw as time to head to the swim start. The swim had been moved to the canals thanks to some low activity off the coast causing very large swell- as much as I had been looking forward to an ocean swim, I was glad we weren’t swimming in what was awful conditions on the beach. I think of all the legs I was most worried about the swim. As they say- with riding and running if you can’t go any further you can just stop, but if you stop swimming you drown! But what I do know about my swimming is that if I can just find a rhythm, I usually can keep going. Luckily that’s what I was able to do- and even better I was able to find that rhythm with 2 or 3 other girls so to some degree we could pace ourselves off each other. At one stage as we came around a corner of the island we were swimming around I thought I saw the finish line ahead and got excited…only to be disappointed when I realised we had really only just reached our u-turn and were only just over half way. I don’t know if anyone else is the same but its not until I think I have nearly finished a leg of a tri or a race, that I really start to struggle. I lost my rhythm and had to work hard to try and find it again. Unfortunately this was the same time when the male team swimmers from the next wave caught up to us and started to swim through our little pack of swimmers. One even managed to give me a firm breast stroke kick to the chest (why he was doing breast stroke I still don’t know) which winded me momentarily. 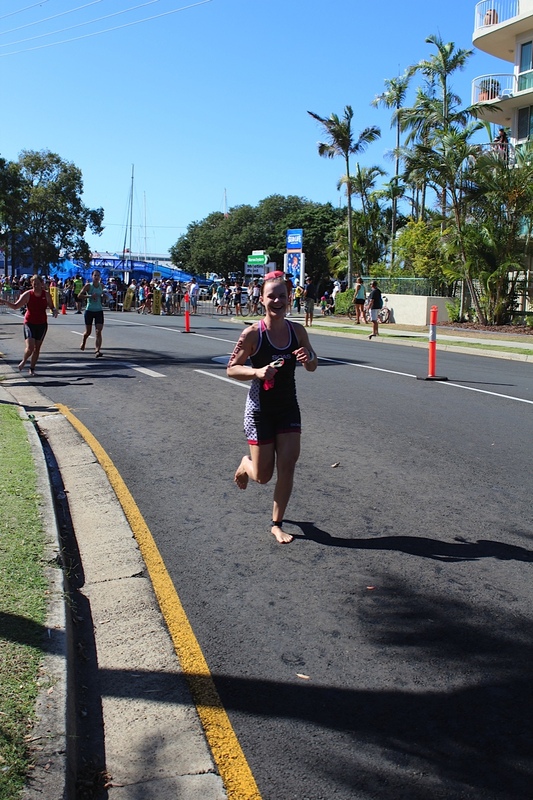 I was struggling by this point but just kept trying to focus on finding a rhythm..repeating to myself ‘Just keep swimming’ and soon enough we were swimming through the double Mooloolaba tri markers and headed for the beach. 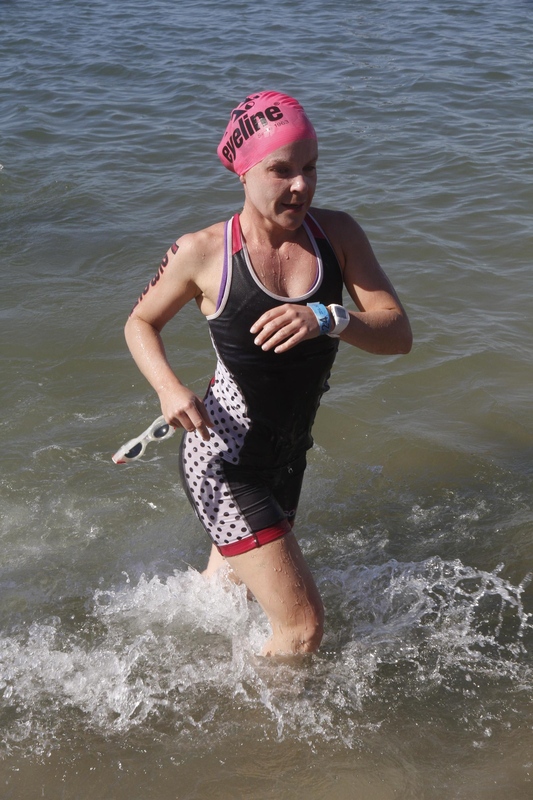 I was finally out of the water and making my way on the 400m run to transition. On the way I passed my sister and friends where I had left them and as the photos show- I couldn’t stop smiling. 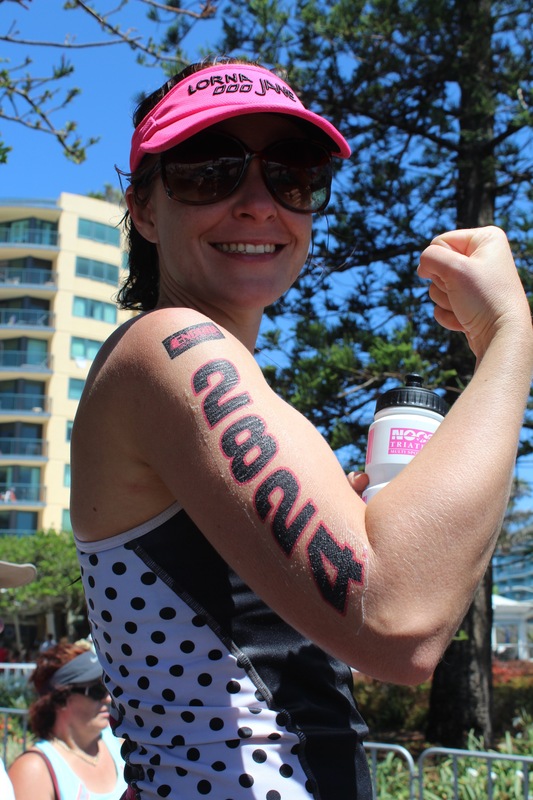 Run from swim to transition- can’t stop smiling! I had been very worried about this longer run to transition as I really struggle with the run from the swim leg as I can’t seem to catch my breath, but for some reason this run seemed to come quite easily (maybe I paced myself a little better knowing it was going to be a bit longer). My bike was super easy to find and I was soon heading out on the bike leg. One of the cyclists from a team I was staying with had told me there was only one hill and so when I felt strong going up the first hill out of Mooloolaba I was feeling positive about the ride leg. Unfortunately that may have been a fib…there was still quite a few more hills before I reached the flats of the highway. Ife was a little more conditioned to the bike, these hills may have not been such a big deal (they were nothing compared to the hills along Pine Mountain Rd on the RTCC) but they were taking it out of my physically and mentally. I must admit my legs (particularly hamstrings) always struggle to make the transition from swim to ride (I think they struggle more with this than the bike to run transition). Eventually, after some serious self doubt set in, I was at the highway and riding into head winds. I was struggling to maintain a decent speed and was just determined to get to the turn around so those winds could push me home. Unfortunately it wasn’t too long until ahead of me I saw some cyclists that had been involved in a collision. Many were riding straight past and the guy in front of me and I were the first (and only) to stop. One of the riders was lying on her back caught in between the two bikes and was in a lot of pain, the other rider had some pretty nasty gravel rash but was able t stand and eventually got back on her bike and continued (which I thought was absolutely amazing). It was hard not to get emotional whilst waiting there with the injured rider as I was immediately reminded of why I was there that day- for my sister. This girls cries in pain reminded me of that awful night and following days sitting by my sisters bedside where every slight movement caused immense amounts of pain. It took a lot not to break down in tears right then and to focus on why I was there- to help this girl until the ambulance arrived. She did settle and 15 minutes later the ambulance was there and she was off to get the help she needed. I was so disappointed in so many people that day that rode straight past, and especially in a guy that yelled at me to get her off the road (clearly knows nothing about potential spinal injuries). I used this emotion and anger to fuel me through the head winds to the turn around and my focus became getting back to my sister and best friend to tell her how much I love her. It seemed to take a long time to get to the turn around and I became particularly concerned by the fact I had lost a water bottle in my stop to help at the crash. With my legs screaming, I finally reached the turn around and thoroughly enjoyed the wind assisted speed on the way home (I was able to sit well above 30km/hr for the rest of the highway leg) and then it was time to make it back over those hills and into transition. After a quick loo and drink stop in transition, it was time for a 10km run. I still wasn’t sure if I had this in me mentally or in my legs, but I saw my sister just as I left transition and again was just determined to get back to the finish line where she would be waiting for me. It was starting to get very hot, and because I had consumed less water than I had wanted on the bike I needed to get to that first water station quickly. The energy chews were also starting to cause havoc in my guts, with cramping starting (I suspect they weren’t quite sure what to do with all this sugar after a very clean diet for the previous 10 weeks!). Before the first turn around I saw a friend who was also struggling with a tummy upset, I stopped and walked with him for a bit but was pushed on by knowing he was on his second lap and I still had another lap and a half to go. We started running together but he was starting to really struggle and told me to just go on. Lots of people were struggling on the run course. I was so grateful for the people with hoses that were wetting us down and I was taking water for drinking and pouring over myself at every run station. I decided against any more electrolytes or sugar, I should have had enough of this on board from my Endura and chomps and I didn’t need any more upsetting my guts. I walked up parts of the hills, but other than that I was able to find a rhythm and just keep running. I’m not sure whether it was being this close to the finish line, or so long over my planned finishing time or what it was but the run was definitely my best leg of the day. 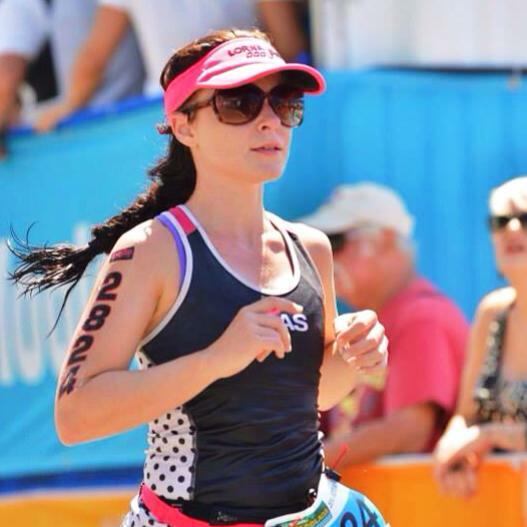 I was so happy that I hadn’t lost too much running fitness, it was by no means fast but it was the only leg where I was able to get into the zone and keep pushing on. Finally I was making my way up the hill for the last time, and it was time for the downhill run to the finish line. As I approached the finish line I saw the same friend who had been struggling on the run leg- he had finished and was looking ok. Time for a sprint to the finish line and as I approached I hear the cheers and screams of my wonderful support team. I was so happy- the thrill that I get every time I cross that finish line filled me and I could not wipe the smile off my face. 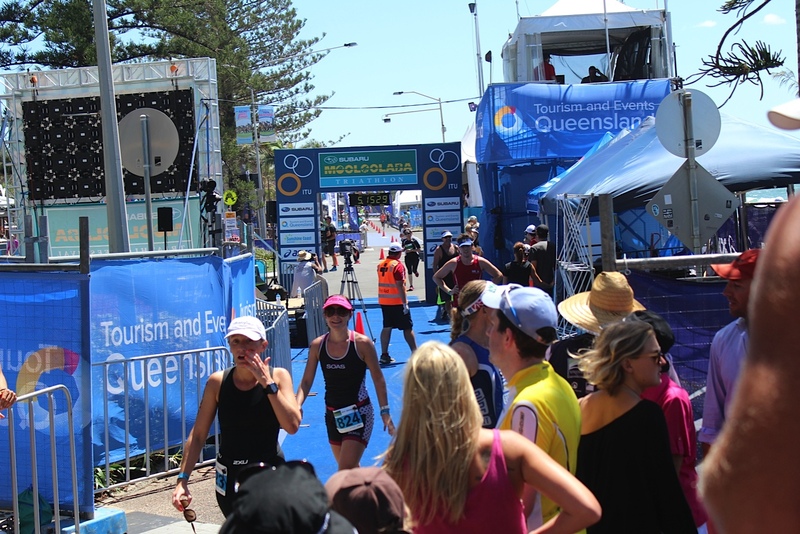 My supporters were just a few metres down from the finish and were screaming and high fiving- I had finished. After taking a few minutes to catch my breath and get my timing chip off I made the walk up the chute to water and some fruit, the emotions of the last 3.5 hours started to hit home. I was on the verge of a panic attack and I knew before I saw my beautiful sister I had to calm down, it was lucky it took a few minutes to get through the line for water and watermelon and then Jem wasn’t where I had last seen her. Even though I had calmed down by the time I got back to my supporters, as soon as I saw Jem I burst into tears. The poor thing probably had no idea what was going on but all I could say for that point in time was ‘I love you’. After I calmed down I could explain what had happened and why I was so emotional. This race, albeit slow, was for her. I pushed myself mentally and physically because of the strength and determination she has shown in her recovery from some horrendous injuries so far. 6 months ago I nearly lost my sister, there will never be a day where I take her love and friendship for granted and I hope there is never a day where she knows how much I love her and how she inspires me to be a better person every single day! ← We have always been beautiful!